Latest Astra 2E news and potential loss of BBC & ITV satellite channels in Southern Spain and Portugal. See our news page for the latest information on Astra 2E, 2F, 2G and loss of BBC & ITV. On 6th February, 2014 most free UK TV services were transferred to a new satellite, Astra 2E. The move of channels to Astra 2E and Astra 2F has proven catastrophic for viewers of public service channels in southern Spain, Portugal, and parts of eastern and southern Europe. 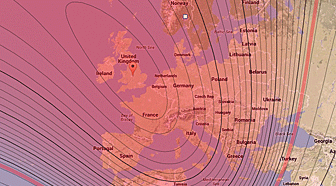 Astra 1N is being moved to 19º east to serve mainland Europe. Astra 2C will be moved back to 28.2º. Astra 2A will remain in position. Astra 2B is out of service in a temporary position and will eventually be at 19º East. 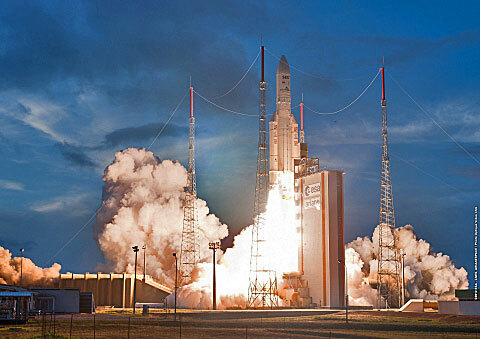 Astra 2E was launched on September 29th 2013 and went into service on 6th. February 2014. Astra 2G was launched in December 2014. All are Astrium - built Eurostar 3000 models, with higher power but narrower, more focussed beams. They are replacements for Astra 2A, Astra 2B and Astra 2D. Sky, Subscriptions and the BBC. Subscribing to Sky will not bring back the lost BBC channels. They appear in the Sky guide but are free to receive, if you can get a signal. All BBC channels, on both the Freesat and Sky platforms, have moved to Astra 2F and Astra 2E's narrow UK beams. The last replacement satellite at 28.2º, Astra 2G, went into service in 2015. It may be the last time a satellite is replaced at the UK slot. Broadcasting is moving increasingly towards internet delivery, with Netflix and Amazon Prime showing the way. Satellite broadcasting is very expensive and vulnerable to bad weather. Sky is currenty testing internet TV with its NOW TV service. At some point in the future, it may decide to move all its channels to an IP-(internet protocol) based platform.